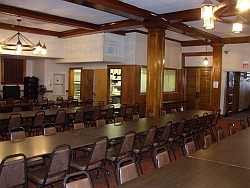 Our facilities banquet room can accomodate 250 for sit-down dinner. Used for weddings, reunions, holiday parties along with Lodge activities and social events. The Heritage Room is available to members who need a smaller venue and is also used for committee and other meetings. Seats 40. The third floor has a beautiful Billliard Room with two billiard tables for use by members and their guests.